VietNamNet Bridge – Pham Ngoc Phan of Binh Thuan won the 'King of Mountain' title at the Tà Cú Mountain Climbing Open in the southern province of Binh Thuan yesterday. On the women’s side, Hoang Thi Ngoc Hoa of Binh Phuoc won the Queen of Mountain award. The second and third place went to Nguyen Thi Thuy Duong of Dong Nai and Nguyen Thi Thuy Dung of Binh Phuoc. In the team rankings, Dong Nai took the title, followed by Ba Ria – Vung Tau and Binh Thuan. 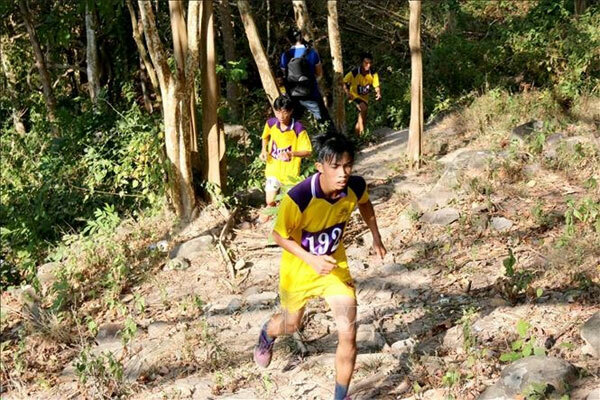 The annual event attracted the participation of 309 athletes from 39 teams of six provinces including Lam Dong, Binh Phuoc, Dong Nai and Binh Duong, competing competed over a 5,300m and a 6,300m course respectively. The event was live broadcast on local Television and was cheered by hundreds of visitors along the road leading to Ta Cu mountain. The event created a cheerful atmosphere for first days of Lunar New Year and was an opportunity for teams to exchange with each other.